Normally just a Saturday thing - here, they're an everyday thing. Your comfy living area doubles as Recovery Central after a day outside. Keep it low-key with board games and movies. Jump on tubes or a toboggan and hear the kids squeal the whole way down (even under earmuffs!). A spa visit is non-negotiable - book an afternoon or two. The 78,000 square foot athletic facility invites. Cascade Village Lift is steps away. Get an early start on slopes. 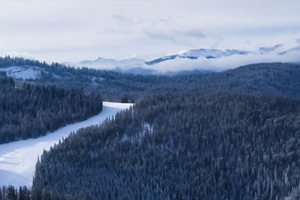 You don't have to stand in line and wait for a shuttle, the resort has ski-in/ski-out access. Enjoy the beautiful view of Gore Creek from the heated infinity-edge pool. Relax with a hot stone massage, hydrating facial or a mani-pedi at Aria Athletic Club & Spa. The resort has 3 outdoor hot tubs - try them all and pick your favorite. It's just a 13 minute drive to Booth Falls Trailhead – pack the car and go. Brush up on your game at Vail Mountain Golf Club, 7 minutes drive away. One- to three-bedroom condos are about 500 to nearly 1,200 square feet and sleep four to six guests. All condos feature full kitchens for leisurely mornings in (because breakfast is meant to be eaten in PJs). Don’t feel like cooking? In-room dining to the rescue! Round up orders and phone it in. Plush bathrobes are available upon request, and bathrooms come stocked with hair dryers and family-sized amenities from Aria Spa. Avoid the dreaded post-vacation mountain of laundry and let the in-unit washer/dryer do their thing while you’re at the spa or pool Then (you clearly have a gift for multi-tasking). Then when you get home, all you have to do is unpack. Daily housekeeping means more time with your kids, so gather everyone around the living room fireplace for daily stories from the slopes. Vail Cascade Condos has shuttle service to Lionshead Village, home to several must-browse shops and tempting restaurants. Stock up on fleece, casual wear and snow boots or sandals at Patagonia. Looking to rent a bike? Head to Vail Sports, Arrabelle. Tavern on the Square, located within the Arrabelle at Vail Square, features a few legendary signature dishes. Try the Lobster Mac & Cheese and garlic fries. Or go for New York-style pizza by the slice at Blue Moose. Get adventuresome and try the Bacon Cheeseburger Pizza (best of both worlds). Be sure to ask the locals about favorite ski runs or hiking trails. - The front desk is open 8:00 AM - 7:00 PM daily. Front desk hours are subject to change depending on a number of check-ins scheduled. Guests that are planning to arrive after front desk hours must contact the property in advance using information on the booking confirmation to receive a code to a lockbox located outside the front desk. A mandatory resort fee is due upon check-out. The resort fee charged at condo accommodations is 7.5-percent of the room rate/night year round. The resort fee includes access to a fitness and health facility, shuttle service to Lionshead and Vail Villages, and ski concierge services.